If your Windows 8 tablet has been infected by a virus or has become slow to the point of being unusable, resetting the tablet to factory settings may be the best and quickest solution. 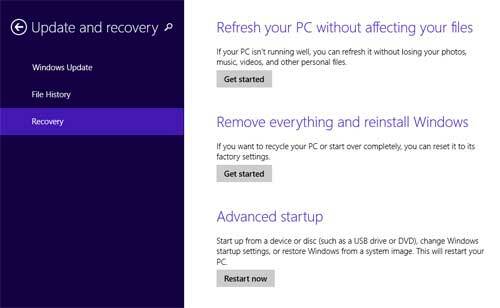 Luckily, Windows 8 has built-in tool to reset your tablet to its original state. In this article I’ll show you 2 options to reset Windows 8 tablet to factory settings. WARNING: All your documents, pictures, settings, accounts and any other data on your Windows 8 tablet will be deleted while performing factory reset. Swipe in from the right edge of the screen, tap Settings. If you’re using a mouse, point to the upper-right corner of the screen, move the mouse pointer down, click Settings. Tap or click Change PC settings. Tap or click Update and recovery, and then tap or click Recovery. Under Remove everything and reinstall Windows, tap or click Get started. 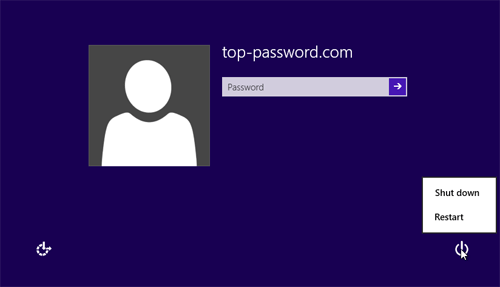 From the Windows sign-in screen, tap or click the Power icon in the lower right corner of the sign-in screen. While the Shift key is still pressed, tap or click Restart. After the tablet restarts, the Choose an option screen will display. Tap or click Reset your PC. If you don’t have a keyboard connected to Windows 8 tablet, you’ll need to use the on-screen keyboard to do these reset steps. From the Windows 8 sign-in screen, tap or click the Ease of access icon in the lower-left corner of the screen, and then tap or click On-Screen Keyboard.